The Polish Review of International and European Law is primarily devoted to demonstrating and promoting research findings of the Polish scholarship in international and European law. The Review covers various fields of international law, both public and private, and the European Union law. We are aware of the interdependency of various levels of legal regulations in today's world, which points out the flexibility of borders of internationality of contemporary law. 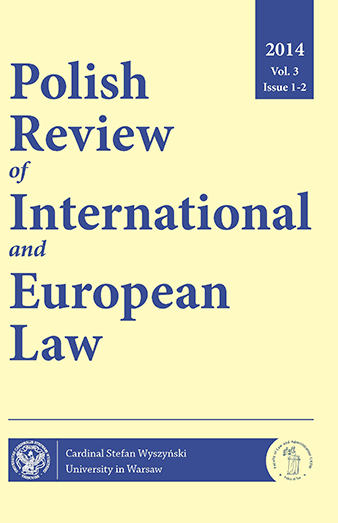 Beginning from volume 4, the Polish Review of International and European Law is published semiannually. Besides, special issues are possible devoted to particularly important and current legal problems. We very much welcome studies (more than 20pp. ), articles (app. 20pp. ), reviews, case comments and other materials prepared in English. It is also possible to publish one text in French in each issue. Although the Journal is mainly addressed to Polish authors, we do not close our pages to any scholar. The Polish Review of International and European Law has made available in an open access format issues 1/2017 and 2/2017. Issue 2/2017 has just been published and it will be available from the UKSW Press and in HeinOnline.